Generally at the center of this murmur is John Green, the author of the now-iconic The Fault In Our Stars, whose book, now having enjoyed a 103-weeks-and-counting reign on the New York Times Best Seller list, has developed a titan status in the category. (It's become the hallmark to which other "realistic YA" is now pegged — however unfair that is — and some have argued that Green's gigantic status has even affected the success of women authors in the category.) Green's visibility has only increased lately as he makes the rounds in promotion of the blockbuster adaptation of the book released on June 6, starring Shailene Woodley. 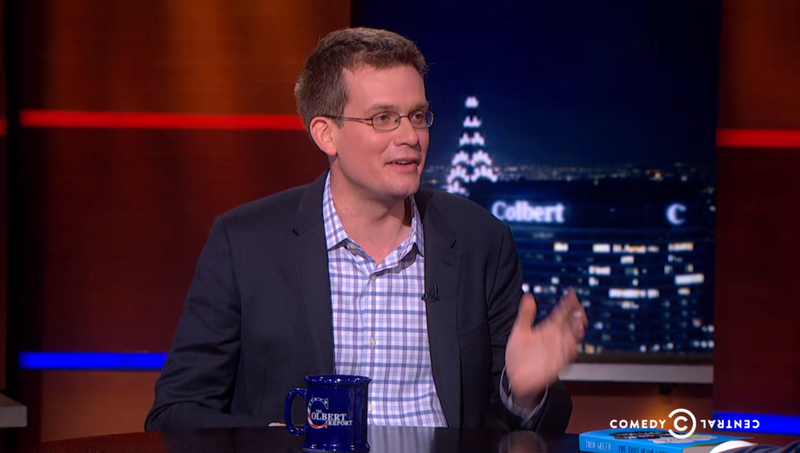 On Monday night's 'Colbert Report,' both Green and Colbert added their commentary to the blossoming discussion on YA. Colbert asked Green, "This has been called a 'Young Adult novel.' How do you feel about that term 'Young Adult novel?' Because as far as I can tell, a 'Young Adult novel' is a regular novel that people actually read." Green responded, "There is a ghettoization, but there is also that connotation, 'Oh, I might actually like reading this.'" The two also talk about Green crying while he wrote the book (and now while he watches the movie), his side project The Vlogbrothers and The Project for Awesome, and the possibility that both he and Colbert are both cult leaders. As you do. Watch above.